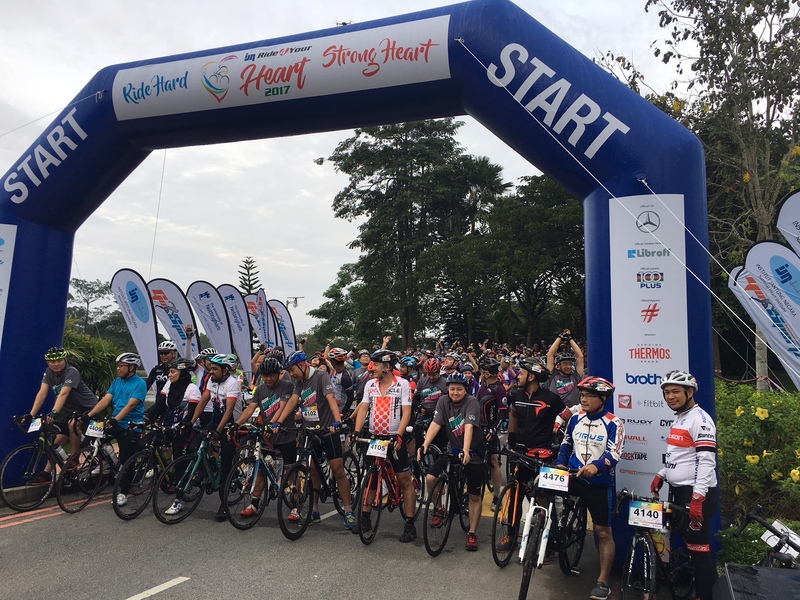 On 26 November 2017, about 1,700 cyclists took part in the 2nd edition of ‘IJN Ride 4 Your Heart 2017’, which took place at the University of Nottingham Malaysia. The event was jointly organised by the National Heart Institute (Institut Jantung Negara, IJN) and GoSportz. This year, the event has attracted foreign participants from 18 countries, such as United Kingdom, Brunei, Singapore, Indonesia, Philippines, Netherlands, Argentina, Australia and Ireland. The ride featured 115km of scenic cycling routes, passing through the 130 million years old rainforest and rural areas of Semenyih, Peres, Kuala Klawang, Lenggeng and Broga in Selangor and Negeri Sembilan. For about 1,700 cyclists who took part in the ride, it was a challenging experience due to the undulating terrain and gradual hill climbs over a long distance. For those who did not take on the full course, there was a 38km fun ride for recreational participants. 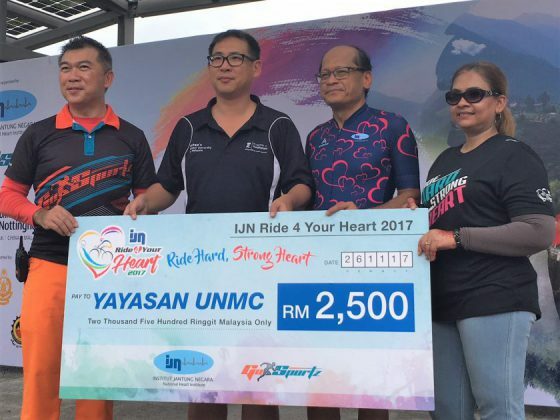 The “IJN Ride 4 Your Heart 2017” was held in conjunction with IJN’s 25th anniversary as a healthcare provider and its position as a centre of cardiac excellence and research. The IJN Chief Executive Officer (CEO) Datuk Seri Dr Mohd Azhari Yakub said, “It’s a great way for IJN to celebrate our 25th anniversary through cycling and cycling events like this, which bring people together. Cycling is a healthy, low-impact exercise that can be enjoyed by communities and families. IJN has always been a strong advocate of a healthy and active lifestyle, as we believe that prevention is better than treatment for heart disease.” As an avid cyclist, he had also participated in the 115km cycling event, along with riders from the IJN’s own cycling group. For the details of the results, event pictures and other information, please visit the website www.gosportz.my. IJN was established on 1 August 1992 as a heart specialist institution committed to delivering advanced standards in cardiovascular and thoracic medicine for adult and paediatric heart patients. Since the foundation of the institute, IJN has treated over a million patients and gained recognition as one of the leading cardiovascular and thoracic health centres in the region. GoSportz Sdn Bhd’s principal business is in sports marketing and event management. The company is led by partners with vast experience in sports event organisation and management. It is also backed by a group of industry players with more than 20 years of experience in organising sports events such as triathlons, duathlons, running and cycling events, both in Malaysia and abroad. GoSportz provides total event management solutions ranging from initiation to execution, resource planning, technical advisory, equipment rental, human resource and marketing support to sponsorship management.